Daelyn Godfrey tosses confetti in the air at last year's New Year's Eve at Noon celebration at the Creative Discovery Museum, 321 Chestnut St. 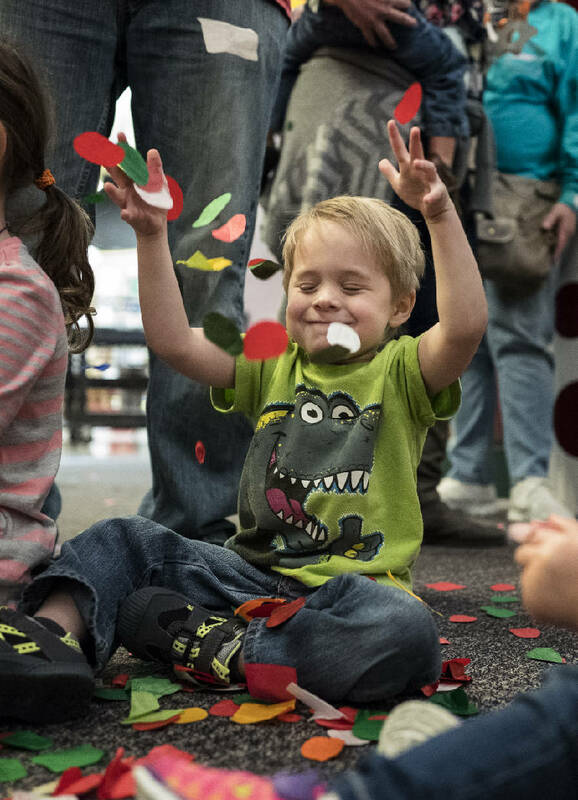 Families can ring in 2018 at the children's museum at 2:18 p.m. today with a visit from Baby New Year and Father Time, crafts, parades, confetti, an apple juice toast and a dance party. The museum is open from 10 a.m. to 4 p.m. For more information, call 423-756-2738 or visit www.cdmfun.org. If you're attending any kind of social gathering to ring in the New Year, chances are someone is going to offer a toast. But just what are the dos and don'ts of toasting? Etiquette expert Sharon Schweitzer, founder of Access to Culture, offers these toasting tips. -First toast: In light of their planning, and financing, the host or hostess of the dinner or social party offers the first toast. At an informal dinner party or table of friends, however, a guest can propose the first toast to thank the host for organizing the event or gathering. -To clink or not: Today it's not necessary. You may choose to clink your glass, or not. Avoid making others uncomfortable by refraining from comments like "I don't clink." Etiquette is about others feeling comfortable in your presence. -Toast boundaries: In the U.S., New Year's Eve toasts are extremely brief, sometimes 10 to 15 seconds; occurring with much fanfare at midnight. If you don't want to be kissed by strangers, stay close to your date, extend your hand for a handshake, provide your cheek for an air-kiss or excuse yourself before midnight. POLL: Do you make New Year's resolutions? -Popping champagne: There is a proper way to open a bottle of champagne to avoid the spray, injuring someone with the cork or spilling a precious drop. Hold the bottle at a 45-degree angle while grasping the champagne cork gently with the one hand, and turn the bottom of the bottle firmly with the other hand. Be sure to twist the bottom of the bottle slowly, until you feel the cork gently release in your hand. -Nonalcoholic toasts: Toasting is about the sentiment of the occasion, not the liquid in the glass. Some guests refrain from consuming alcohol for health and medical reasons. People undergoing medical treatment, in recovery, or taking certain prescription medication cannot take even "just one sip." It is impolite to insist that they do, because they can still acceptably join in the toasting with a sparkling beverage, ginger ale, club soda, seltzer or juice. If you do not drink and are offered an alcoholic beverage, simply say, "no thank you." -New Year's Eve at CDM: The Creative Discovery Museum greets the new year a little later than usual, 2:18 for 2018. Look for a visit from Father Time, crafts, parades, confetti, an apple juice toast and a dance party. Activities are scheduled 10 a.m.-4 p.m. Admission is $13.95. 423-756-2738, www.cdmfun.org. -New Year's Eve in West Village: This inaugural celebration is a two-parter, starting with family-friendly events in the early evening and ending with an adults party (see below) in the newly christened West Village, the area of downtown on Eighth Street between Chestnut and Pine streets. Kid-centric activities, including face painting, a mime, balloon sculptor, caricature artist, stilt walkers and Looie the Lookout, last from 6 to 8 p.m., with a Not-So-Late Ball Drop at 7:30 p.m. Also, a laser show will light up the side of the Westin hotel on the hour from 6 to 10 p.m.
-Zoo Year's Eve: This wild party for families includes games, animal meet-and-greets, a resolution station and the chance to count down the clock in time zones around the world. Enrichment activities are scheduled at 11 a.m. with the spider monkeys, noon with the cougars (including a ball drop into their habitat), 1 p.m. with the snow leopards and 2 p.m. with the chimps. Activities are free with regular admission: $9.95 adults, $6.95 children 3-12. 423-697-1322, www.chattzoo.org. Here are a few of the bigger adult parties taking place around Chattanooga. -New Year's Eve in West Village: This new event begins with family-friendly activities at 6 p.m. (see above), including a laser show lighting up the side of the Westin hotel on the hour from 6 to 10 p.m. The adult party that follows includes food trucks, a beer wagon, cocktails and wine for sale, and a DJ. After the last laser show, the video screen will show a live feed of New York City's Times Square celebration leading up to the midnight ball drop. Several nearby businesses will be open extended hours. Party central is the newly christened West Village, the area of downtown on Eighth Street between Chestnut and Pine streets. -Disco Wonderland: Wear your favorite disco attire for this 7 p.m. to 1 a.m. party at the Dwell Hotel, 120 E. 10th St. The $60 ticket includes unlimited champagne, party food and music by DJ Flux 308. 423-267-7866. -Late Skate at Ice on the Landing: This family-oriented late-skate party, 11 p.m.-1 a.m., includes a DJ playing music, New Year's Eve souvenirs and a sparkling cider toast at midnight. The rink is at the Chattanooga Choo Choo, 1400 Market St. Cost is $25 for adults, $20 for children 12 and younger. www.iceonthelanding.com/parties. -New Year's at The Palms: Enjoy dinner, dancing, party favors and champagne at The Palms at Hamilton, 6925 Shallowford Road. Dinner seatings begin at 8 p.m.; the party lasts until 3 a.m. Cost is $80 per individual, $150 per couple. Call 423-499-5055 for reservations. -New Year's Eve Celebration: The Chattanoogan hotel, 1201 S. Broad St., offers various packages with overnight accommodations, valet parking, admission for two to the New Year's Eve party and admission for two to the New Year's Day breakfast buffet. The New Year's Eve celebration, set for 9 p.m. to 1 a.m., includes party favors, dancing to music of The Power Players and a champagne toast at midnight. Call 423-756-3400 for package prices. -New Year's Eve Dinner and Show: Puckett's Grocery & Restaurant, 2 W. Aquarium Way, will serve its regular menu on New Year's Eve until 7 p.m., when it will close to prepare for the New Year's Eve celebration. Seating for dinner, a three-course affair with a choice of four entrees, is at 9 p.m. The Embellishers, featuring Troy Underwood and Gary Hermstreet, will begin playing at 10:30 p.m. until the champagne toast at midnight. Cost is $50. Reservations are required. Call 423-708-8505. -New Year's Eve Dinner Train: Tennessee Valley Railroad Museum, 4119 Cromwell Road, will serve a three-course dinner aboard a restored 1924 dining car on a leisurely train excursion, with seatings at 5 or 8 p.m. Diners choose their entrees when ordering tickets. Cost is $75 per seat in the dining car, $85 per seat in the luxury Pullman car. 423-894-8028. -New Year's on the River: Cruise into the new year on the Southern Belle riverboat, complete with a DJ, prime rib dinner, party favors and champagne toast at midnight. Catch the bowl games on the third-deck bar's television. Excursions last from 4 to 6 p.m. or 9 p.m. to 1 a.m. Boarding is at 201 Riverfront Parkway. Cost is $49.90 ages 13 and older, $24.90 ages 3-12 for the 4 p.m. cruise; $129 per person (must be 21 or older) for the 9 p.m. cruise. 423-266-4488. -New Year's Rockin' Eve: The Beaters headline this blowout at the Chattanooga Choo Choo, 1400 Market St. The evening includes a cash bar and door prizes during band breaks. Festivities are scheduled from 7:30 p.m. to 1 a.m. for a $40 ticket. 423-266-5000. -New Year's Eve at the Pint: The Honest Pint, 35 Patten Parkway, hosts Nick Lutsko and Genki Genki Panic for a party featuring giant puppets, surf rock, party favors and free champagne at midnight. The party starts at 9:30 p.m. and ends at 2:30 a.m. Tickets are $20. 423-468-4192. -Party on the Bluff: Dance to music by SoundForce Entertainment and enjoy hors d'oeuvres, open bar and midnight champagne toast at the Hunter Museum of American Art, 10 Bluff View, between 9 p.m. and 1 a.m. Tickets are $150 per person, $280 per couple. 423-267-0968. -Wild in the Winter: Previously a private party, this year's event at the Chattanooga Convention Center, 1150 Carter St., is open to the public, with music by Classic City Jukebox, a rock band from Athens, Ga., and a local DJ, Groove Professor. Dress is black-tie optional, meaning that suits are required and tuxedos are preferred (no blue jeans, casual shoes, T-shirts, sweaters, etc.). The fun lasts from 9:30 p.m. to 1:30 a.m. Cost is $30 per person, $50 per couple. Cash bars will be available. 423-756-0001.